Music from the past sung and played on a variety of traditional plucked, bowed, hammered and woodwind instruments. The Harper and The Minstrel specialize in beautiful ayres and ballads, but are quite adept at jigs, reels & dances. 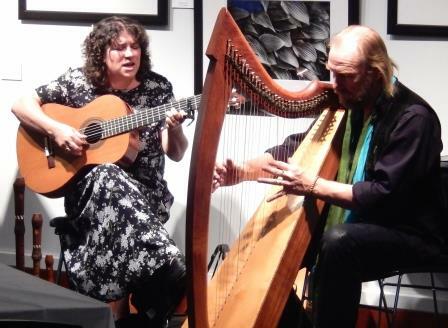 Their vast repertoire includes unique arrangements of music ranging from medieval Spain’s 13th century Cantgas de Santa Maria to the music of Elizabethan era English lutenist John Dowland to 17th Century Irish harper Turlough O’Carolan to the music of Sting, the Beatles and much more. This entry was posted in Uncategorized on April 13, 2019 by Judith Whitney-Terry. Climate Changes are Happening Now. . . . This discussion will focus on global, national and local impacts from rapidly warming climate and what actions are happening and need to happen in order to mitigate the worst scenarios. 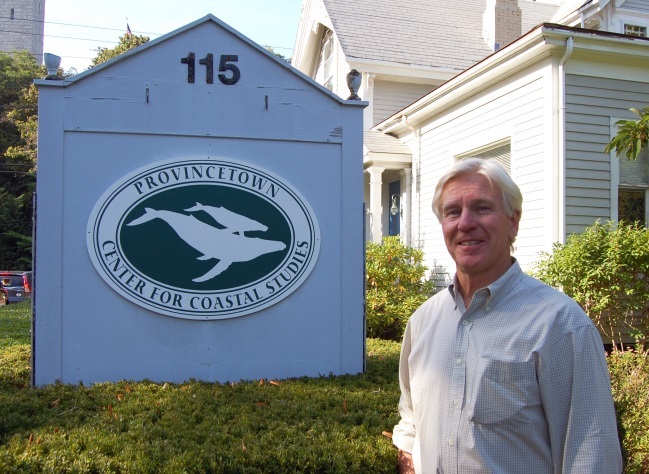 Richard Delaney is the President and CEO of the Center for Coastal Studies. Previously, he served as founding Director of the Urban Harbors Institute at University of Massachusetts Boston; Assistant Secretary of Environmental Affairs and Director of the Massachusetts Coastal Zone Management Program. He is an officer in the Global Ocean Forum and has organized international “Ocean Days” at many climate conferences including the Paris Climate Conference in 2015. He is also founding President of the Cape Cod Climate Change Collaborative. This entry was posted in Uncategorized on March 19, 2019 by Judith Whitney-Terry. 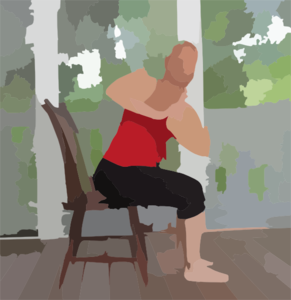 Aisling’s program for us will involve movement, music, and instruction as she shares with us her love of yoga and its abilities to heal and transform. Aisling Gainer is a well-known and much appreciated teacher. She lives in Orleans, MA. This entry was posted in Uncategorized and tagged #aisling gainer #orleans on March 9, 2019 by Judith Whitney-Terry. Cumberland performs the traditional songs and tunes of Southern Appalachians accompanied by guitar, banjo, tenor banjo and mandolin. 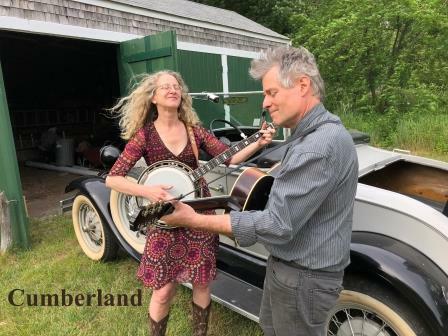 Jim and Lynda draw heavily on the repertoire of the Carter Family and early bluegrass and string band music, and weave these influences into contemporary songs as well. Jim Rohrer has toured and recorded with Southern Rail. His is currently host of WOMR’s Bradford Street Bluegrass. Lynda Shuster is also a member of Bourbon Street. This entry was posted in Sunday Programs on March 2, 2019 by Judith Whitney-Terry. We can influence the function of our brain in very positive ways. Current neuroscience research into the brain has given us a much more complete portrait of brain functioning than has ever before been possible. In this program we”ll focus on where memory is stored in the brain and how we can nurture and build this area through movement and the foods we eat. 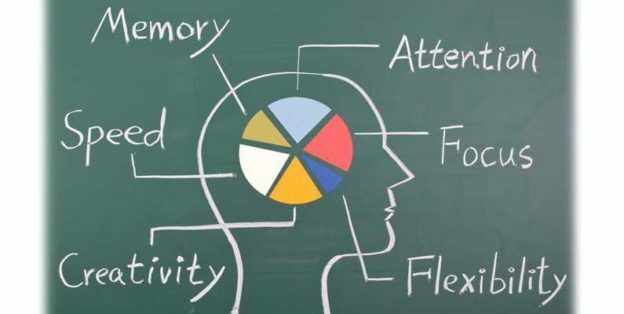 With a little knowledge and effort, our brain and our memory can be well cared for! 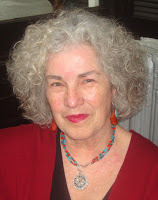 Jaya Karlson, of Wellfleet, has been a natural therapeutics and somatic specialist for 3 decades. 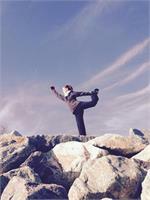 She teaches qigong, meditation, and yoga and has deep interest in the ways of mind/body connection. This entry was posted in Uncategorized on March 2, 2019 by Judith Whitney-Terry. Sometimes our feathered and furry neighbors need a healing hand from Wild Care, a nonprofit wildlife hospital located in Eastham dedicated to the rescue and release of injured and orphaned wildlife on Cape Cod. Wild Care rehabilitates over 1,700 animals per year–everything from Bald Eagles to White-Footed mice. Wild Care Executive Director Stephanie Ellis will discuss “what to do” when you find animals in distress and will provide tips on living with our wild neighbors. 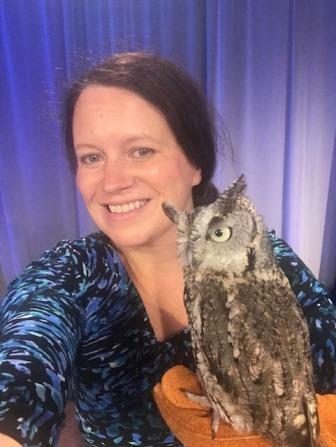 She will also bring special guests, “Nickerson,” an educational Eastern Screech Owl, and “turtle #45,” Wild Care’s beloved educational Eastern Box Turtle. Stephanie Ellis has been working with wildlife for nearly a decade on both coasts, and holds a special affinity for birds. She was the Animal Care Coordinator of the Wildlife Center of Silicon Valley and served as Executive Director of the Santa Clara Valley Audubon Society in California, and as the Interim Executive Director of the San Francisco Bay Bird Observatory. She has been at the helm of Wild Care’s wildlife rehabilitation work since 2016. This entry was posted in Uncategorized on February 10, 2019 by Judith Whitney-Terry. This stone statue is made of a stone quarried in the Green Mountain National Forest called Verde Antique. It is known as the world’s premier luxury stone, often found in antique Boston furniture. The Verde Antique stone is also known as the world’ hardest and oldest stone, and therefore before the “Green Mountain Boy,” deemed impractical for stone art. John Brault has a degree in environmental science, but has spent the past twenty years as a full-time professional artist, carving and painting wildlife. John spent a lot of time as a little boy roaming on Cape Cod beaches in the late 1960’s, and has returned here the last two winters to volunteer for the New England Coastal Wildlife Alliance’s Team Mola. 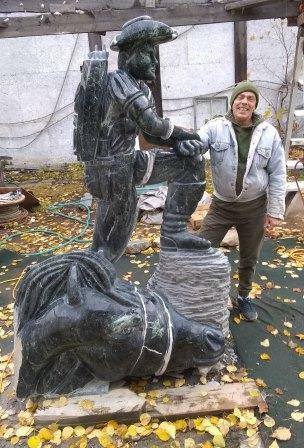 He is currently preparing for his next life-sized statue of a “Fisherwomen,” to be done Lake Champlain Black Marble. This entry was posted in Uncategorized on February 2, 2019 by Judith Whitney-Terry. 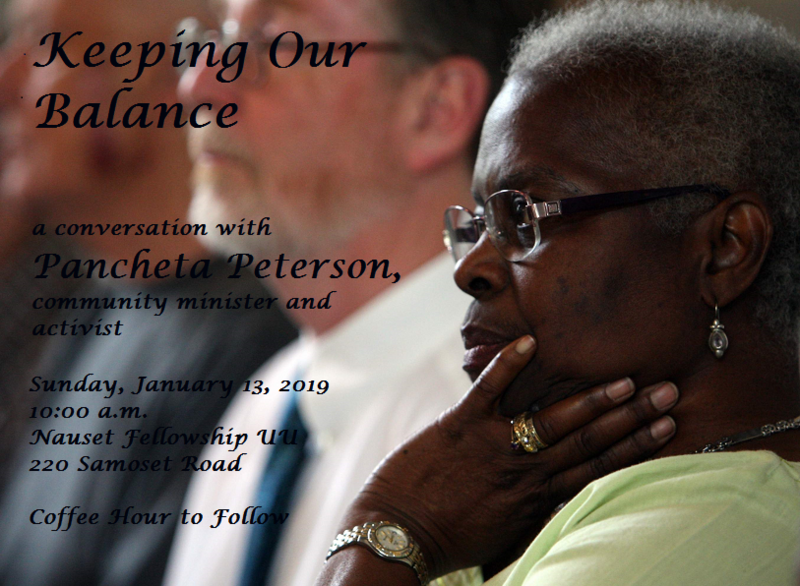 Join us next Sunday for a conversation led by community minister Pancheta Peterson. All are welcome to participate! This entry was posted in Uncategorized on January 6, 2019 by Judith Whitney-Terry. Join us for a family-friendly holiday movie: A Christmas Memory, adapted from a short story by Truman Capote originally published in Mademoiselle magazine. Created for television in 1966, this production stars Geraldine Page and Donnie Melvin with narration by Truman Capote. Both the teleplay and Geraldine Page won Emmy Awards for this production, which also won the coveted Peabody Award. 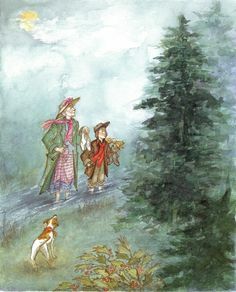 The story told is of the last Christmas together in Depression era Alabama for a sensitive boy and his elderly cousin who was his closest friend. 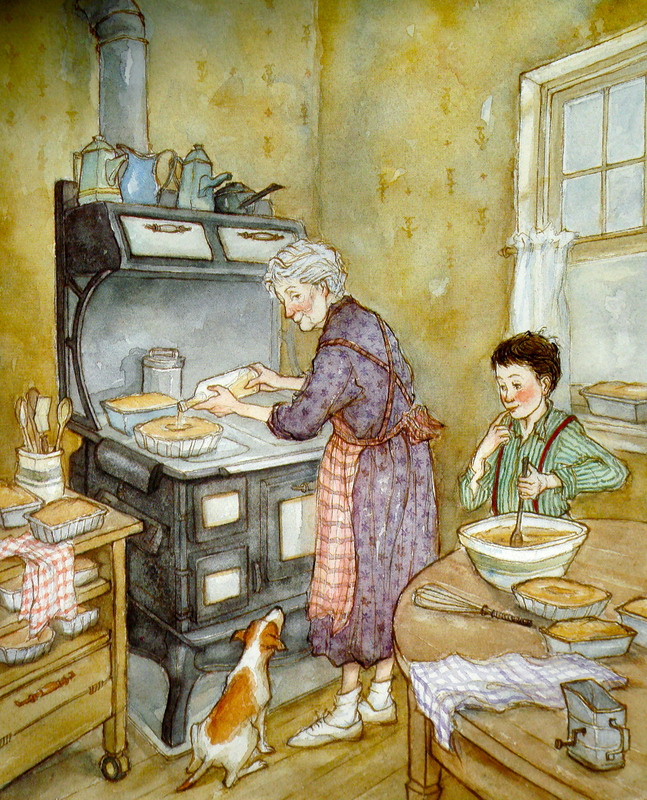 The two raise enough money to buy the ingredients for 30 fruit cakes, sent mostly to strangers like FDR. They spend Christmas day flying the kites they made for each other while Capote’s voice over explains their separation, followed by their dog’s passing, and a few years later her’s. A story of love, loss, and loneliness is a holiday tradition that will warm your heart, and break it a little as well. Great fodder for conversation based on memory, values and our vision for the future. This entry was posted in Uncategorized on December 17, 2018 by Judith Whitney-Terry.